It’s normal and human to complain. Life doesn’t always go as planned or to our likes. Yep, life may not be fair, but life just is, and if you don’t relax and go with the flow of things and accept them or change them, you turn into an angry person who only complains out of habit, becoming a part of you without you even realizing it. However, everyone else does notice and even if they might not tell you, it’s a drag to all. You become a self-centered bore and not only that, because who really cares? 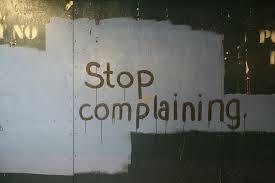 You are who you are, but complaining will only attract more of the same unwanted stuff into your life. Do you really want that? Endless complaining without any action drives people away. Because not only does it drag others down, but also might be catching! Remain for a while with a wet blanket and you’ll find yourself doing exactly the same, complaining and nagging about the same old things again and again. An ever-stagnant individual everyone tries to avoid.